Keeping stuff waterproof is about baking it in! In practise it is more or less impossible to maintain waterproofs at the same level of water repellency as when new. I am not talking waterproofing, but water repellency which is what the DWR finish is all about. There are several reasons for this. First is that the DWR (Durable Water Repellent) finish is applied to fabric under heat whilst it is in the textile factory and prior to being made up as a garment. When using after-care treatments no brands like to suggest you heat it in, because of the risk of damage to the garment and its trims. But the other reason is that the DWR after finish is now almost all C8 free and doesn’t benefit from heating and so isn’t as durable. C8 is the stuff that Greenpeace has campaigned strongly against, as its getting into the environment and its not good. However, it is much more durable, having a stronger bond. The newer finishes are much less durable. Its important to to maintain the repellency to avoid the fabric wetting out, when the mvtr then disappears. In regular speak it’s not then ‘breathable’. For an experiment to see if I could prolong the life of the repellency on my garments I bought a can of the only remaining treatment with C8 treatment, Grangers Extreme Repel and dried them in the washing machine at the lowest setting. I almost ‘cooked’ them so take care if you are trying this! What you can feel is a very, very smooth slippery surface which makes water bead into large drops. 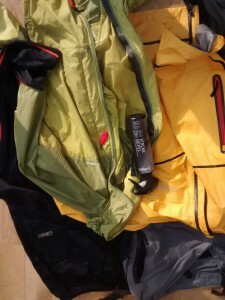 I also did the same to my windshell and pants. The wicking capability will be decreased but the minor air flow passing through these tightly woven fabrics will remain unchanged. In 2 weeks time after crossing Scotland I should be able to judge if the DWR held up better than Marian’s garments which weren’t ‘baked in”. Thanks Charles, useful as ever. He is doing well so far!